My campaign for mayorship of my neighborhood is flagging, but I am still the mayor of The Larder, in Doylestown, our favorite condo in Ocean City, MD, The Blacktail Meadows Kids Fish Pond in Dillon, MT, and, of course, the Furia Rubel office. No, I’m not talking about an actual elected office. I am “mayor” of all those places on Foursquare, the location-based social networking app. You may not have heard of it, but your clients have – and they may already be on it talking about your firm without you. That is enough reason for us here at Furia Rubel to advise our clients to get to know social networks beyond Facebook and Twitter. Public discourse takes place online in today’s world, and even if you’re not part of the conversation on a particular platform – yet – you need to know what other people are saying. More than 45 million people use Foursquare, the company said in January 2014. That is phenomenal growth from the network’s birth in March 2009, when founders Dennis Crowley and Naveen Selvadurai launched it at South by Southwest Interactive in Austin, Texas. More than 1.5 million businesses already are marketing themselves on Foursquare, claiming their listings, offering specials to customers, and using check-in information to glean insights into where their customers are coming from. The goal: ensuring that those customers come back. So what is Foursquare? After downloading the mobile app, people use their mobile devices to “check in” to the places they visit. Picking up the dry cleaning? Whip out your phone and check in. Stopping at the grocery store? There’s another check in. Grabbing a latte at the coffee shop? Check in again. For a primer on all the things you can do, check out Foursquare 101. You might be asking why anyone would do this. What’s the point? When I first started using Foursquare in 2010, it was mostly for fun. Competitive by nature, I was attracted to the ability to earn points and “badges” by performing specific tasks. On Nov. 6, 2012, I checked in at my local polling place and earned the “I Voted 2012” badge. On April 7, 2013, I snagged the “Super Swarm” badge when I (along with more than 250 other people) checked into Citizens Bank Park to watch the Phillies play the Kansas City Royals. On Feb. 24, 2014, I earned the “Navigator” badge when I checked in to the National Air and Space Museum. Foursquare is still fun for me and the millions of other people who use it daily. From cupcake shops to craft breweries, customers are checking in, earning badges, sharing photos and leaving tips for others. But today, I actually use Foursquare to shape my behavior – read: I use it to decide where to go, what to see and do, and how to spend my money. On a recent trip to Washington D.C., I opened up Foursquare to search for a restaurant near my hotel. I checked the ratings and tips left by previous Foursquare users and ended up at a sushi joint a few blocks’ walk away. Because of its interactive, public nature, Foursquare is most useful for retail and entertainment venues that court customer foot traffic. Professional service providers such as lawyers and accountants may be tempted to ignore Foursquare, assuming it doesn’t readily apply to them. While we don’t advise professional providers to devote much time and effort to Foursquare marketing at this time, we do advise firms to take control of their Foursquare listings now. Remember, anyone can create a Foursquare listing for any location. A law firm client may already have created a Foursquare listing for your office so he or she can check in there. That is part of your online presence, and you should be in control of the information that appears there, to the fullest extent possible. 1. 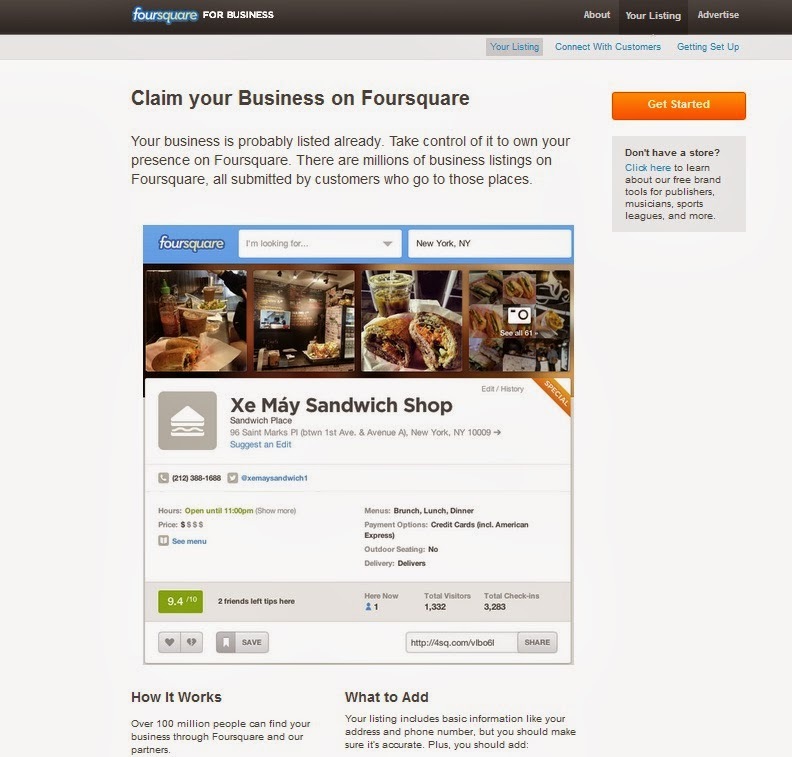 From a desktop computer, visit the Foursquare website and search for your business name and location. 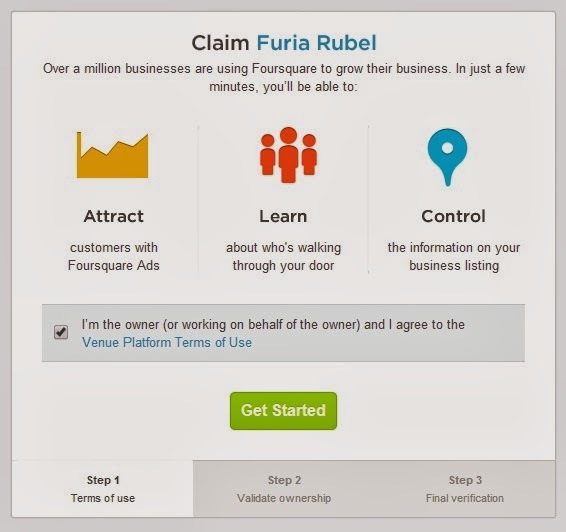 If someone already has created a listing for your business, click on the “select” button. If not, you can add it by clicking on the link at the bottom. 2. Enter your phone number to receive a call to verify your ownership of the listing; when the call comes in, provide the information requested. 3. You don't need to pay $20 for an expedited verification; check the box for Foursquare to send you the verification by mail for free. 4. Once you have control of your listing, add a photo and list important information, including a description of your business, your address and phone number, the hours that your office is open, and a link to your website. As with all social media, remember that ethics rules govern what lawyers, financial advisors and other professionals can and cannot – or should and should not – say on public platforms. 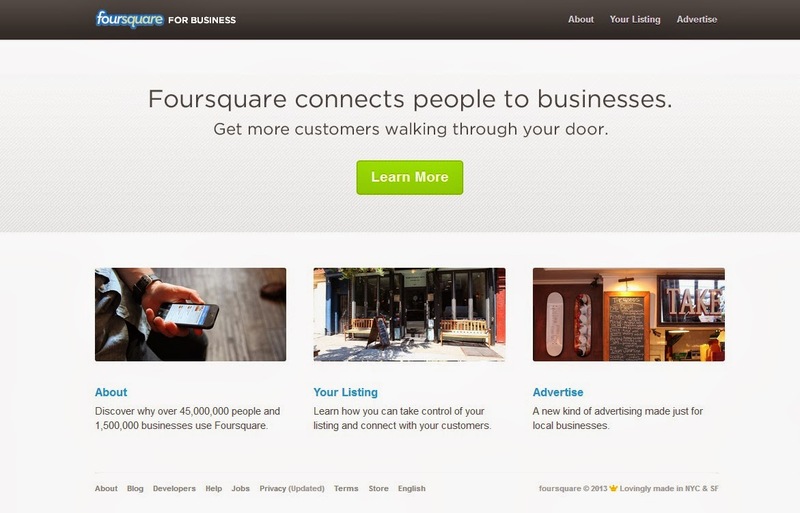 Taking control of your Foursquare listing, however, is a safe and easy step to protect your company’s brand online. And once you start using Foursquare personally, you may find out you like it. Just don’t try to take my mayorship.